A number of people have come out of the wordwork to say One Step doesn’t have a huge, long-term study to prove our approach is better than just continuing to push veganism. All the facts that drive One Step are therefore irrelevant and are thus ignored. Unlike others, this result makes us want to do better. Here’s a story from One Step advisor Dan Kuzma about how we can do better. I have been busy giving guest lectures to start off the semester, and my two favorites were when I got to talk to a Writing 2 class regarding One Step For Animals (in order to give them some potential research topics). I distributed 1S booklets to each student in the two classes. 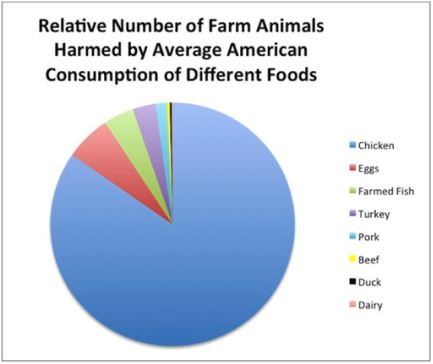 My presentation consisted of a basic introduction, showing the One Step Matters video, then elaborating further by showing the two graphs regarding farmed animals. I made a point of always coming back to animals, specifically chickens. I asked the class: How many chickens are in a bucket of chicken? How many buckets of chicken do you think people consume? 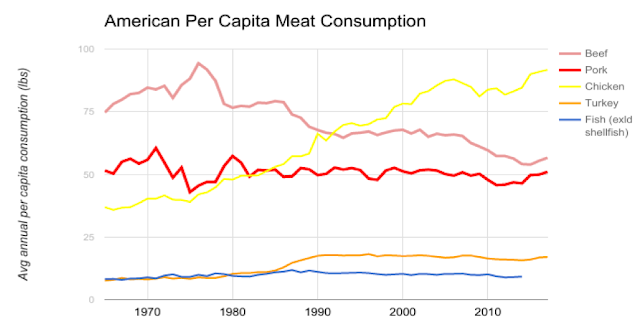 I also noted the cost of chicken per pound and cited Chipotle's pricing for meats - chicken is $0.50 cheaper than Steak and Carnitas. I mentioned how One Step is different from other organizations, based on our decades of experience and learning from our mistakes, while using current data regarding consumption trends and studies on effective advocacy to hone in on what is conceivably the best approach to reduce animal suffering. I also made certain to not alienate anyone or make it seem like the talk was about me, even though I had to talk a bit about myself and share my Steps in getting here. (We know that people like stories, so this helped maintain attention.) I did speak briefly on health and well-being by sharing my story because it added some humor. 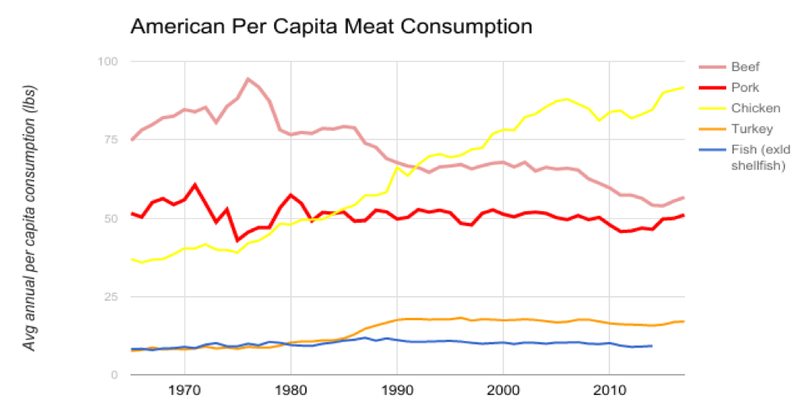 When I was 16 and seeking more information about vegetarian health and nutrition, my then-doctor basically lied to me. I told them not to be misled by any claims of inferiority or superiority regarding meatless diets. Always track the source! I also got a question about laws to protect animals, to which I asked the class, Who drives over the speed limit? Do you always get pulled over when you speed? I mentioned there is some strength in recognition by laws, but the lack and futility of enforcement weakens the laws. I referenced undercover videos of factory farms to illustrate that the industry is not scared of breaking laws. And since politics changes, we cannot rely upon laws completely.